Who would have thought one of our leading contemporary composers has a 'private passion' for Roy Orbison? Well, that is precisely what Harrison Birtwistle revealed in his selection of music for the BBC Radio 3 programme Private Passions. 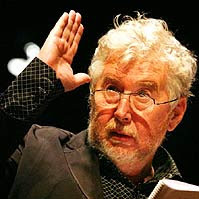 Birtwistle was born in Lancashire in 1934, and while studying at the Royal Northern College of Music with Peter Maxwell Davies, Alexander Goehr, John Ogdon and Elgar Howarth formed the influential New Music Manchester group. He then went on to study in the US on a Harkness Fellowship. His music is influenced by Stravinsky, Messiaen and Varèse. He produced a number of compositions that were central to the development of late 20th century music. These included Harrison's Clocks (1998) for piano, The Triumph of Time (1971) for orchestra, and the operas Punch and Judy (1967) and The Mask of Orpheus (1984), the latter work winning the $150,000 Grawemeyer Award in Music Composition in 1987. His avant garde style made the media headlines in 1995 when his composition Panic for drums, alto saxophone and orchestra disturbed the complacent jingoism of the traditional Last Night of the BBC Promende Concerts season. But just before the dawn, I awake and find you gone. I remember that you said goodbye. That's quite a surprise, re: the Orbison, coming from that cantankerous old sod. I love some of his music a lot. I think his operas The Mask of Orpheus (please, ENO, if you didn't destroy the sets, revive it, even if it's only for 4 performances) and The Second Mrs. Kong are great opreas and one of the highlights of my concert going life was hearing Simon Rattle conduct Earth Dances with the CBSO in 1999. I love Secret Theatre and Antiphonies as well. I'm not a fan of his more ritualistic/repetitive stuff and I find his chamber music to be arid but that's ok; what I love of his music, I have in regular rotation. While the Palestrina, Debussy, Stravinsky, and Boulez choices are perhaps to be expected (though perhaps English medieval part-music was to be expected rather than Palestrina?) -- I find the Ravi Shankar raga choice -- instead of a work by Busoni, Varese, or Messiaen -- quite intriguing (and primal). "In Dreams" is the new "Apres au Reve." ;-) I kid. But although cheesy, there is something appealing about it. I think it's Orbison's voice and singing style. I now have the urge to discover and listen to more (being that Orbison's popularity was way before my time). Anyone who has seen David Lynch's Blue Velvet can appreciate how terrifying 'In Dreams' can be. I wonder if Birtwistle knows the film?